JACKSON, Mississippi (AP) — Anne Moody, whose memoir Coming of Age in Mississippi gave a wrenching account of growing up poor in the segregated South and facing violence as a civil rights activist, died Thursday at her home in the small town of Gloster, Mississippi. She was 74. Moody had dementia the past several years and stopped eating two days before she died in her sleep, her sister, Adline Moody, told The Associated Press on Saturday. 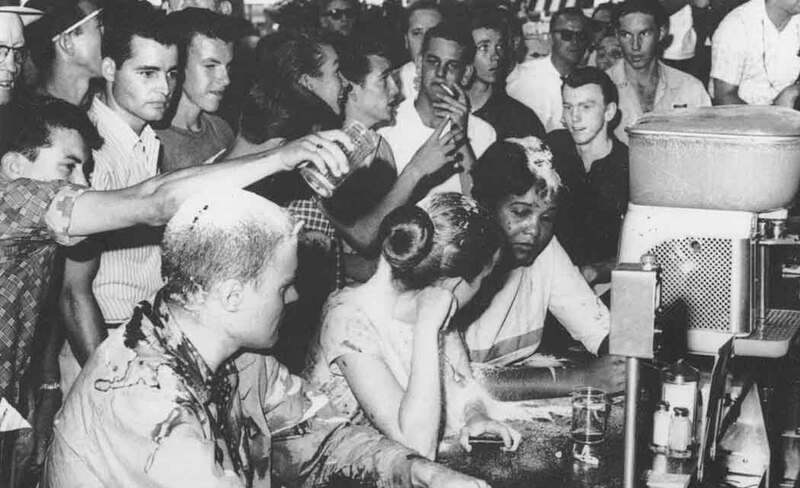 On May 28, 1963, Anne Moody was among the students from historically black Tougaloo College who staged a sit-in at a segregated Woolworth’s lunch counter in downtown Jackson, Mississippi. A white mob attacked the integrated group of peaceful students, dousing them with ketchup, mustard and sugar and beating one of the men. A photograph from the sit-in shows Moody sitting stoically at the lunch counter with food on her head. Moody’s eyes are downcast as a man pours more food on one of her fellow students, Joan Trumpauer. Moody wrote in her 1968 memoir that “all hell broke loose” after she and two other black students, Memphis Norman and Pearlena Lewis, prayed at the lunch counter. 300 whites screamed at and jostled them. The Rev. Ed King, a white Methodist minister who was the Tougaloo chaplain in 1963, went to Woolworth’s as an observer. During a 2009 AP interview, King recalled he reported to Medgar Evers, the Mississippi leader of the NAACP civil rights group, what was happening. The sit-in lasted several hours before the store closed. The mob was dispersed and the Tougaloo contingent returned to the campus in north Jackson. The protest was part of a months-long boycott that the NAACP led against white-owned businesses in downtown Jackson. The protesters’ demands included the hiring of black police officers and bank clerks, the elimination of segregated water fountains and lunch counters; and the hiring of black clerks at downtown stores. Two weeks after the sit-in, Evers was assassinated outside his family’s Jackson home. Anne Moody left Mississippi, and the civil rights movement, after she went to New York in the 1960s to give a speech about the movement, her sister said. Adline Moody said her sister was burned out by the work. Both sisters lived outside Mississippi for decades and moved back to the state in the mid-1990s, Adline Moody said. Even after Anne Moody returned, she never felt at ease in Mississippi, her sister said. Moody did not attend a 2013 ceremony where state officials unveiled a historical marker commemorating the 50th anniversary of the sit-in. Adline Moody said Saturday that she admired the courage of her sister, who was two years her senior.